Spring is the time when all of nature seems to wake up from the cold spells of winter just gone, and life under water is no exception. The water temperature starts its initial rise and allows cold-blooded carp to become a little more active to go in search of more food. The increased demand for energy creates the need for carp to begin feeding frequently and as a result, you’ll stand a better chance of catching a big carp during the springtime. I won’t use particles too much in spring. I prefer to use boilies as many contain a wider range of complete nutrition for the carp. Particles provide some good nutrition but are generally not complete sources for carp, thus, they are often best used during the summer months. Don’t get me wrong, sweetcorn, maize and peas are very good baits and they’ll catch some good carp all year round, but I think boilies just edge them as the best bait to use in spring. I think particles are good in summer when using higher levels of oils for added attraction, but I prefer to keep oil contents low, or only to medium, levels during spring as the water may still not be high enough for them to have effective use. At this time of year, I believe carp will be roaming around looking for new food sources to exploit in order to gain sufficient energy and nutrition for the following months ahead. In March, when the weather starts to warm up gradually into springtime, I think about what bait I’m going to use for the season ahead. I tend to opt for boilies for catching during the spring months. With such a choice of boilies available, I look at whether to use a highly nutritious food source in boilies or whether to target the bigger fish using self-life boilies. For the first few fishing sessions in spring I believe in using self-life for the majority of time, and here’s why…. I want to attract them towards my hookbait by using high-smelling, highly visible, attractor boilies. Yes, I want to establish a new food source of bait for use during the entire fishing season ahead, but this takes time and establishing new baits can be done on non-fishing days, or after finishing a short roaming session. For these first few sessions during spring, I prefer to fish for bites, and for me, this means using a good shelf-life, high attractor boilie, preferably with a bright colour. High visibility, highly scented attractor boilies that attract carp will probably work much better during spring time on a lake. The carp at this time of year will start to develop more hunger and will be interested in galloping down all sorts of food to satisfy their energy needs. Therefore, a bright, smelling boilies that is easy to find will produce more takes. Using a high nutritional value boilie will take time to establish as a food source, and HNV types would be better to use when carp have become wary of the attractor boilies after they’ve been caught numerous times during the first part of the season. Also, because the vast majority of fish are hooked when they eject the bait, it can pay to have the hookbait over-flavoured so they eject it harder. This enables the point of the hook to penetrate deeper into the lip for effective hooking potential without the necessity for using bolt rig methods. This means I can continue using lighter leads when setting up the rigs and enable more sensitive bite indications, which may still be necessary because the water temperature will not be at its optimum during the spring. For baiting tactics in spring I generally prefer to fish for individual bites by placing out enough for the carp to eat one or two mouthfuls of food. This is where I’ll often place out a single high-attract boilie with a small PVA bag of pellets attached to the hook. This provides enough food for a single carp so it may produce competitive feeding if more than one fish approaches the rig. I may even try this same technique using maggots in the PVA bag, or sometimes fish for carp using the medusa maggot rig with a maggot feeder of the cage type attached. 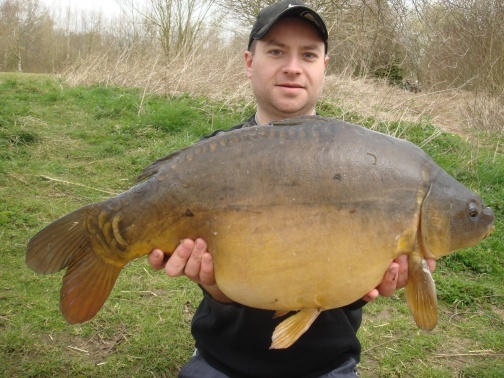 Maggots are a brilliant fishing bait to use during spring, they are live which creates good fish attraction and will provide carp with immediate satisfaction. I believe this is the time of year when we can get away with using big round and over-flavoured boilies because the carp are usually still a little dormant from the previous cold spells of winter and may not be as alert to potential dangers yet. It could even be possible to get away with using other blatant rig presentations as well as huge boilies. Also, the carp in most lakes haven’t been pressured from anglers for many months, so their guard may be a little lower during this time than at any other time of the year. Maybe this is one reason why many big carp are caught during the spring months? Another good tactic in spring is to use air-dried chopped boilies that have been re-hydrated using various liquid attractors. There are many fruit flavoured attractor liquids that can be used for additional attraction (pineapple is a good choice) as well as some food-type liquids such as nutramino or any other made by the big, reputable bait manufacturers. If you make your own baits then try using a birdseed base mix during spring. The flavours tend to leak really well from the seeds and help to attract carp onto the hookbait. For rig tactics, I prefer to use the snowman set up. Using large, bright, high-attract boilies tied on with a snowman rig set up is going to be a better fishing tactic in spring I personally believe! What About Finding the Fish in Spring? I want to fish where there are normally weed beds present, or if I’m aware of any new weed buds sprouting up around the lake. The growth of new weed is usually where the lake has started to receive an increase in light, and thus, higher temperatures are possible. I really think that a higher temperature is a priority for carp during spring just as much as in winter. Therefore, a good place to always consider fishing any lake is at the northeast corners because this is usually a position that’s covered from the cold winds blowing in from the northeast areas. It’s also the windward bank when the warm winds blow from the southwest direction. Therefore, it may be a good place to start locating carp in springtime. Another area to fish for carp is near any old rush beds, these banks tend to receive good sunlight, hence why the rush is there in the first place, and carp will always visit these areas during the spring sunshine. They will also use rush beds and snags to clean themselves of leeches during the spring.